In today’s wide world of available firefighting foam products, a number of fire chiefs with industrial responsibilities are looking beyond installing traditional foam proportioning systems alone and are investigating and then specifying an additional component like Compressed Air Foam Systems. Ask virtually any refinery fire chief about specifying the right high-volume foam proportioning system for an industrial pumper application in a refinery, and he’ll say that identifying the intended firefighting purpose of the vehicle and the type of Class B fire fighting foam concentrate that will be used are just two of many important factors needing be considered in the planning process of a new industrial apparatus. In today’s wide world of available foam products, a number of fire chiefs with industrial responsibilities are looking beyond installing traditional proportioning systems alone and are investigating and then specifying an additional component-Compressed Air Foam Systems (CAFS). CAFS have shown to be another valuable tool in the industrial firefighting arsenal that can provide an even higher level of value-added firefighting capability. So what is the big fuss about CAFS and do they really provide industrial firefighters and officers with a significant fireground competitive advantage? 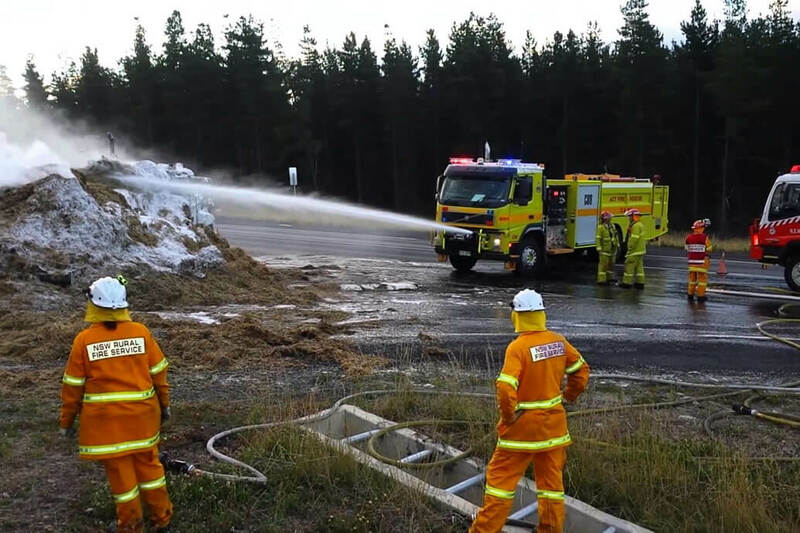 Traditionally used to generate Class A foam for ordinary combustible applications, Compressed Air Foam Systems also generate high-quality Class B finished-foam bubble blankets that cling well to vertical fuel surfaces-steel containment-encountered in industrial firefighting. The high-quality finished-foam CAFS produce will hold moisture contained in the foam blanket on structural steel surfaces. It is not meant as a long term barrier, but rather a short term media that will evaporate thus cooling and lowering surface temperature. Another advantage of turning foam solution-delivery rates into a compressed air foam stream is that various finished-foam qualities can be produced, including “wet, fluid and dry” foam consistencies. The primary difference between the three is the water content and the finished-foam drain time. For example, if there is a small flammable liquid fuel spill, with no fire, applying a “fluid” finished-foam will have a longer drain time then “wet” foam, so the foam blanket will remain for a longer period of time and thus continue to vapor seal the flammable liquid. CAFS can have several benefits for the industrial firefighter. First, for shallow-pool flammable liquid fire, generating a CAFS finished-foam blanket has shown to produce excellent flame knockdown characteristics. Second, the ability to vary the foam consistency can reduce the total liquid (foam solution) that is applied to a given size flammable liquid fire. This can reduce the size of the total problem remaining for clean-up and salvage crews after the fire. Additionally, for firefighters, CAFS hoselines are typically filled with approximately 30% compressed air. This makes them lighter and easier to maneuver. Using Compressed Air Foam Systems, initial attack resources, equipment, personnel and water supplies, typically have far greater fire combat capability. When industrial fire chiefs purchase a properly designed and sized CAFS for the specific firefighting purpose – and obtain good training on its proper use – the technology provides high levels of value to the firefighter, industrial brigade and refinery owner. So what do CAFS consist of? The CAFS hardware concept is simple – it involves combining a fire pump, a foam concentrate injection system and an air compressor to produce high-quality finished-foam streams inside apparatus piping. When looking at specifying a Compressed Air Foam System, it is important to plan ahead and ensure that the system properly matches your departments firefighting needs. Vital is to thoroughly understand the operating characteristics and safety features of the system. This is since industrial firefighters will now be dealing with not only hydraulics and foam proportioning, but pneumatics as well – the delivery of compressed air. Important is to look at system component design and review hands-on system operation, including safety features and system interlocks. These safety features should be seamless to pump operation and prevent pump operators from mistakenly delivering “air” only, or “air and water” only (without foam concentrate) through attack hose. This is critical to initial attack teams who, for example, may be positioned in a potentially deteriorating location ready to trounce a flammable liquid fire. 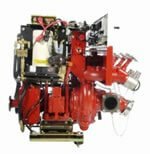 Typically, an industrial fire engine with CAFS has, in addition to the typical high volume Class B foam proportioning system, a rotary air compressor, around 200-SCFM (standard cubic feet per minute) in size, and an electronic foam concentrate injection system. Stated simply, CAFS produce foam streams by supplying water from the fire pump into a manifold where foam concentrate is injected. Compressed air is injected into foam solution. Compressed Air Foam is produced inside the apparatus piping and then transported to fixed monitors and/or through attack hose to portable monitors and handheld nozzles. Reviewing one industrial brigade’s apparatus who recently purchased Compressed Air Foam Systems, we find that their full size engine has the following CAFS capable discharges installed: four 2- inch discharges (two-right side and two-left side), and one rear 2-1/2 inch discharge connected to a preconnected portable monitor. The portable monitor provides a high-flow hard-hitting foam application appliance that’s portable and easily repositioned to suit on-going and changing firefighting needs. When specifying CAFS, there are a variety of items that must be kept in mind by the industrial fire chief. At the top of the list is “easy operation.” Easy operation translates into “low maintenance” for the training officer who’s responsible to see that all pump operators are trained to proficiently and instantly generate the required foam consistency – wet, fluid or dry – safely, every time. If you are an industrial fire chief and are planning the purchase of a new industrial foam truck, make sure you spend the time to thoroughly investigate CAFS technology. You will be glad you did! Based upon the fire testing and field use that has been done, it can be a valuable tool in your firefighting arsenal. About the Author: Dominic J. Colletti is the national OEM accounts manager at Hale Products, Inc. located in Conshohocken, PA. He is a volunteer firefighter with the Royersford, PA, Fire Department and has served with Engine Company 3 of the Cor am, NY, Fire Department. Colletti has over a decade of experience in the research and development of Class A foam and CAFS application for structure firefighting. His e-mail address is: CafsExpert@aol.com.